This page will assist our club members and also visitors on how to use our club’s Rig Expert Antenna Analyser. The analyser is made in the Ukraine and is a marvelous piece of test gear if one knows how to use it. 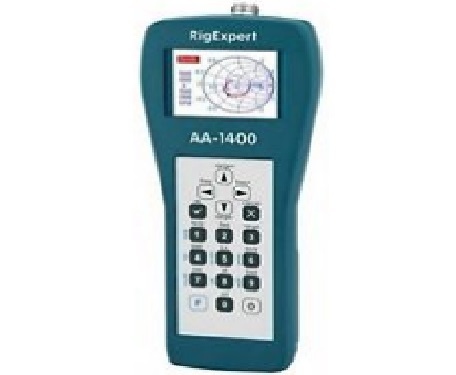 The model AA-1400 is good up to 1.4 Gigahertz or 1400 Megahertz in other words. The analyser is available for short term loan only (up to a week). Please contact a board member with a key to access the instrument. It is an expensive piece of gear so please complete the borrowing book. Attached is a PDF of the manual on how to effectively use this wonderful piece of test equipment. Click on to the link below to download a copy of the manual. Using an analyser is not just a matter of checking for SWR at a particular frequency – you can easily get wildly wrong results, especially if you have an open or short circuit in the cable so please read the manual and understand what you are investigating. The only way to really check a new antenna is to hook it up to a 1/2 wave length of coax (or an exact multiple of half waves). If it is a brand new VHF/UHF antenna and you’re tuning it up, sit it on a wooden chair (or wooden ladder with no strengthening wires) and point the antenna at the sky. Remember for most common coaxes a half wavelength of coax is 0.67*wavelength/2.